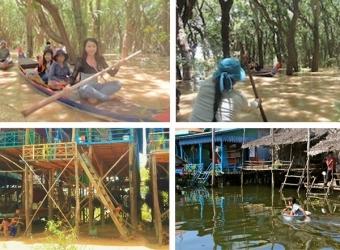 Kampong Phluk, a floating village mounted above the banks of the Tonle-Sap-Great Lake and is home to different families kind out their living on what is considered one of the richest inland-fisheries in the world. When you visit you'll get the best insight into the fascinating lifestyle of the people whose live hood entirely depends upon the flow and ebb of the Tonle Sap Lake. When you arrive at this floating village, you can visit the restaurant, shops and schools, all of which are more above the Tonle Sap Lake. 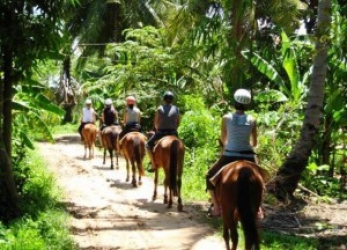 A countryside trail rides from 1 to 4 hours, from sunrise to sunset, our horses will take you on a journey to places that are otherwise unreachable, through local countryside villages, scenic rice fields and tourist-free temple ruins, all waiting to be explored. An authentic taste of the real Khmer lifestyle viewed from horseback, and a welcome break from other tourists. Flight of the Gibbon. A truly amazing way to see the forests of Angkor, from a place humans aren’t supposed to be. It’s at Ta Keo temple (not that it really matters, as they pick you up from any town location). We were taken out in their minibus, to the site, deep in the jungle. Immediately you arrive you get two feelings. The remoteness and jungleness of the place, and the thrill and excitement, yet the reassurance seeing all the safety gear arranged in front of you. Spend an extra time to discover real life of the people and nature in the countryside of Siem Reap. 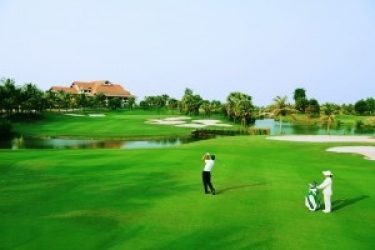 Miles away out of town, you will be sure that you may feel very fresh with the beautiful environment, Green at beginning of rainy and rice season and Gold at the harvest season. 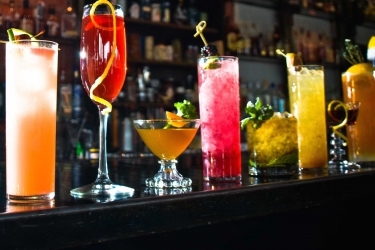 Dinner usually refers to the most significant and important meal of the day, which can be the noon or the evening meal. 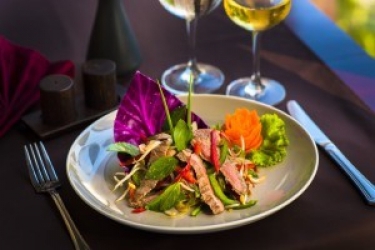 However, the term "dinner" can have many different meanings depending on the culture; it may mean a meal of any size eaten at any time of the day.Historically, it referred to the first meal of the day, eaten around noon, and is still sometimes used for a noon-time meal, particularly if it is a large or main meal. The meaning as the evening meal, generally the largest of the day, is becoming a standard in many parts of theEnglish-speaking world. Start the morning exploring old market / pub street, where the colours and aromas of fresh, vibrant ingredients will thrill your senses. Return to our outdoor kitchen where you will be guided through time-honoured Khmer cooking techniques. 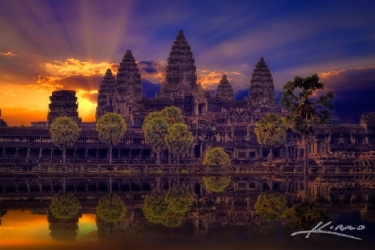 Watch the sun rise over the Angkor Temple to reveal the natural beauty of this area. Roam around and gaze across at the amazing scenery and unrivaled architecture. Stroll through the temple's complex chambers and learn the site's fascinating history. Uniquely Cambodian, Daringly Modern Siem Reap's most unique, authentic, top rated evening entertainment. 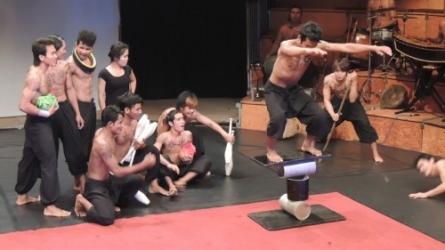 More than just a circus, Phare performers use theater, music, dance and modern circus arts to tell uniquely Cambodian stories; historical, folk and modern. The young circus artists will astonish you with their energy, emotion, enthusiasm and talents. Cambodian New Year (Khmer: បុណ្យចូលឆ្នាំថ្មី) or Choul Chnam Thmey in the Khmer language, literally "Enter New Year", is the name of the Cambodian holiday that celebrates the New Year. The holiday lasts for three days beginning on New Year's Day, which usually falls on April 13th or 14th, which is the end of the harvesting season, when farmers enjoy the fruits of their labor before the rainy season begins. Khmers living abroad may choose to celebrate during a weekend rather than just specifically April 13th through 16th. 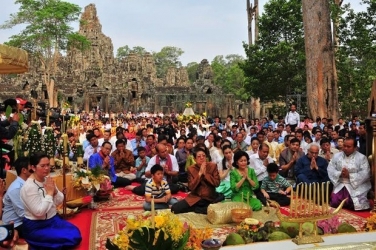 The Khmer New Year coincides with the traditional solar new year in several parts of India, Nepal, Sri Lanka, Puthandu.